‘Inflation expectation disorder’ seems to have become a full pandemic lately. News story after news story is discussing accelerating price growth not as a possible new trend, but as a current reality. “Consumer Inflation Hits 6 Year High” read one headline after the June CPI release. 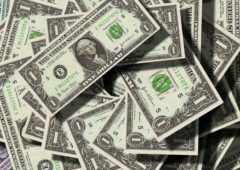 Inflation expectations are also on the rise according to the New York branch of the Federal Reserve, as investors stock up in inflation hedging TIPS. The inflation sirens are thrilled. Constant media presence Peter Schiff has been predicting a “…huge wave of inflation” for years. They say even a broken clock is right sometimes. Is it time to put your money in gold? The Federal Reserve would say no. In his latest public comments, Fed Chairman Powell stated that the “U.S. economy [is] not on the verge of repeating 1970s inflation.” Yet their actions seem to suggest that there may be more to worry about than they are letting on. The Federal Reserve raised rates yet again at their last meeting, with the effective funds rate nearing 2%, the highest in a decade. Why do we care? Fed policies drive up short run rates, say on 1-year treasuries, but they have much less influence on the long end, such as with 10-year bonds. The gap between long-run and short-run interest rates is known as the yield curve and that metric is the lowest it has been since just before the Great Recession began. This is a non-trivial statistic given the strong relationship between inverted yield curves (when short-run rates are actually higher than long-run rates) and the onset of an economic downturn. The last nine recessions were all proceeded by an inverted yield curve. In Beacon Economics’ opinion, there are few signs of true inflationary pressures out there, either current or incipient. In fact, the evidence points to a lack of inflationary pressures as being a larger issue. Yes, the CPI measure of inflation hit a six-year high recently. But this sounds like bigger news than it actually is given how tame inflation has been in recent history. Keep in mind that the 2.9% inflation rate seen last month was just slightly higher than the average rate of inflation was between 2001 and 2013, and lower than the average rate of inflation between the late 1960’s and 2001. In short, inflation is still fairly tame; over the last five years it has been lower than at any time in the last fifty. It is also worth remembering that inflation is a tough number to measure and the estimates can be volatile, particularly when including commodity-based prices on things like food or energy. This is why economists produce a ‘core’ estimate, which excludes these inputs. This core measure is currently only at 2.2% – basically on track with the Fed target. There is also another core estimate that comes from the U.S. Bureau of Economic Analysis called the PCE deflator. This estimate uses a different schedule of weights and is typically lower (and often viewed as more accurate). 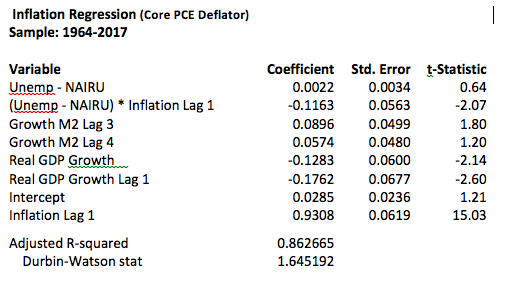 The PCE deflator estimate of inflation is currently running at 1.8%, below the Federal Reserve’s target. Of course, the current level of inflation is not what’s most important; rather, the key is where it’s heading. The primary driver of today’s inflation fear seems to be the tight labor market—so called wage-led inflation. News article after news article refers to low unemployment as the source of the issue, the ‘Phillips Curve’. Does this actually happen? Well, it’s complicated. The answer is yes—but the degree of the impact depends crucially on the underlying inflation conditions. To see this we need to delve into a little statistical analysis—so buckle up. To understand the dynamics, consider a simple VAR model of inflation where we use unemployment relative to an estimate of the ‘full employment’ unemployment rate along with other drivers (money supply and GDP growth). 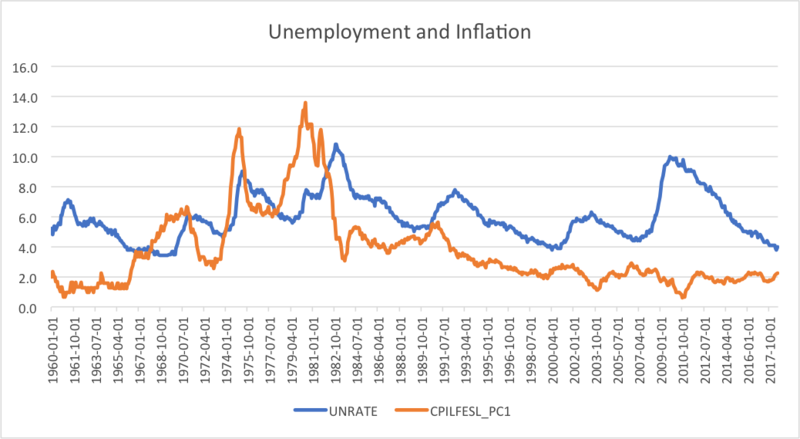 Importantly, we interact the unemployment rate with inflation in the prior year in order to allow for the initial (base) inflation rate to influence the relationship between changes in unemployment and future inflation. This variable as statistically very significant, more so than the unemployment gap by itself. What this tells us is that the impact of falling unemployment on inflation depends on the overall rate of inflation in the system. It is starkly different across inflation regimes. 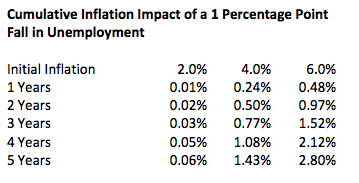 At a 2% rate, the impact of a 1 percentage point drop in unemployment will only add .06% to inflation over 5 years—barely noticeable. In contrast, at an initial inflation level of 6% it would add 2.8% to the total inflation rate over 5 years. In short, you only have to fear low unemployment when inflation is already an issue. This effect is fairly obvious when we look at the data. While unemployment and inflation were negatively correlated to a strong degree in the high-inflation 1970s, over the last twenty years, as the overall pace of inflation has slowed, the business cycle impact has been far more muted. The big question is what the underlying determinant of inflation is – and that is where other variables come into play. The monetary view of inflation is that it is largely caused by changes in the money supply. When there is more money in the system relative to the size of the economy price levels tend to drift up. The extreme of this is hyperinflation, which is caused by governments printing more money to pay for public needs rather than collecting the needed funds through direct taxation. This shows up in the regression as well, with positive coefficients on the lagged estimates of M2 growth and negative ones on real GDP growth. How does this factor into the inflation outlook? In the 1970s, M2 growth averaged over 10% per year, and there were short periods where it was running well over 12%. In contrast, over the past decade, M2 growth has averaged a mere 6% and currently is running at less than 5%. In short, the base conditions for inflation are not in place so low unemployment rates should not be a concern. Indeed, M2 growth is so slow that deflation would seem to be more of a concern over the next few years. This leaves us with a very large question: Why is the Fed being so aggressive in terms of rate hikes? The candid answer is we really don’t know. 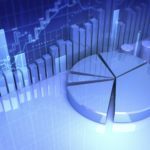 The economy is healthy, and while stock prices may be a bit high, there are no signs of other excesses in the U.S. economy relative to home building, debt accumulation, or business profits. There seems to be no need to ‘cool down’ an over-heated economy. As for the potential of a stock market bubble, the Fed is charged with maintaining price and economic stability—not stock market stability. There is also the argument that the Fed is simply normalizing rates after years of stimulative efforts. But this falls flat as well when we recognize that there is no such thing as a ‘normal’ interest rate, and in any case, a 100 bp spread between 10 year treasury bonds and a 3 month treasury bill is far lower than normal. Another argument is that the Fed is reloading the gun, after all if you already have rates at 0, there is little room to maneuver if the economy does begin to slow. But realistically, with real interest rates as low as they are, the only effective way of giving the Fed room to maneuver would be to push the inflation target to 4% or 5%, rather than the low 2% pace it is at now. Until then, the Fed will have to rely on quantitative easing as it did during the recession. If the Fed stopped right now, there would be little to worry about. While spreads are tight, they were just as tight from 1995 to 2000 and can clearly remain in this low range for a while. But we won’t be so sanguine if the Fed decides to raise rates yet again. Will the Fed keep going? We don’t know. Nor can we say with certainty that if the Fed went so far as to flip the yield curve by pushing short run rates over long run rates, this would necessarily cause a recession. After all, correlation does not mean causation. But what we can say for certain is that the Fed seems to be putting unnecessary stress on an economy that otherwise has been performing very well.